#1 (pee): In Grand Canyon, all urine MUST make it into the river. This means you can’t sneak behind a bush while we’re in camp; again, all urine must make it into the river. Some 20,000+ people raft every year in Grand Canyon and you could imagine how bad that place would smell if everyone were peeing on rocks and bushes in our dry, desert environment. There will be stops during the day so you will have opportunities to go pee. If you have to go between stops, tell the guide before it’s an emergency so they have time to find a good place for a pit stop. There are many other people on the trip with you so there is a good chance, if you have to pee, probably someone else does too. It’s not a big deal. At most pit stops the rule is: Skirts Up, Pants Down. This means that women head upstream to find a spot and men head downstream. For women, wearing two-piece swimsuits or a sports bra and quick drying underwear under your clothes makes peeing into the river easier. One method at pit stops is to wade into the water near the boat, hold on to straps on the side of the boat. The water is cold, so it may take some time to get things flowing! Another option is to head a little way away from the boat, drop your pants or simply pull your swimsuit to the side and squat. You can try and find a rock near the water to squat behind but remember that ALL liquid, pee included, MUST go into the river. Many beaches do not have much cover. DO NOT go on a 3-mile hike to find a rock by the river; when I say head upstream a bit I mean maybe 20 feet. The most important thing is to remember that nobody is looking. If someone is watching you pee, they have the problem, not you! #2 (poop): Savvy river rats know the guides set up a toilet, affectionately called The Groover, as soon as we get to camp in the afternoon and it’s the last thing they take down in the morning. If you do have to go poop during the day, tell the guides and they’ll give you the toilet-to-go system (personal waste bag). This system is a user-friendly way to contain and neutralize human waste and includes toilet paper and an antiseptic towelette. As you’d imagine, it is best to try to do your business when you get into camp, where things are much more comfortable. The camp toilet is a metal vault with a toilet seat on it. 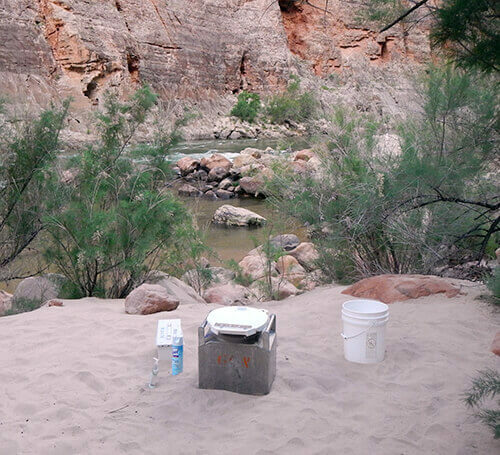 The guides put the toilet in a discreet location with a pretty good view of the Canyon! Toilet paper, disinfectant spray, a feminine hygiene disposal and hand sanitizer will be waiting for you at the toilet. The most important part is the toilet key! We’ll set up a hand wash station and near that lives the toilet “key”. Be sure to take the key with you to the toilet so everyone else who comes along knows it’s occupied. You never want to go to the toilet and forget the key — otherwise, someone else will bring you the key! Please be sure to wash your hands thoroughly at the toilet hand wash after using the groover. If you happen to be on your period while on your river trip, don’t fear. If you will be using tampons, bring a ‘Go With Your Flow Pack’ or several little Ziploc bags and plenty of baby wipes. Make sure you keep these supplies handy during the day, in your provided day dry bag. That way, when you change during the day, you can wrap the trash in a baby wipe, put that in a Ziploc and dispose of it easily, discreetly, and sanitarily in the boat trash system or into the hygiene disposal at the camp toilet. (Typically, each boat has a trash on it — you’ll just tuck your trash deep down into the boat trash.) As you will get wet A LOT on your river trip, using pads for menstruation is not the best option. A handy device used among women river guides is the Diva Cup. It is a reusable menstrual cup that collects menstrual flow rather than absorbs. It is great because it offers up to 12 hours of leak-free protection. Using and cleaning the Diva Cup can take some getting used to so check it out before your river trip to see if it works for you. One recommendation is to use your water bottle to rinse the Diva Cup over the river. The Groover with a beautiful view of the Canyon. Let’s talk pee buckets! Pee buckets are handy to use in camp when it is difficult (rocky, steep or dark) to get to the water to urinate. Pee buckets will be set near the camp toilet hand wash station. Make sure to grab one for use in camp, essentially like a chamber pot. Please use your pee bucket outside of your tent and dump it directly into the river after use or in the morning. Give your pee bucket a good river rinse and the guides will describe the method to sanitize the pee bucket before packing it up for the day. Find where the toilet is set up BEFORE dark! It can be hard to find in the dark if you don’t have a general idea of where it is. Try to get yourself on a schedule — nighttime, after coffee, whatever it may be during in camp hours. Work on that routine even before the rafting trip. DO NOT HOLD IT! Whatever you do, do not try to go the whole trip without using the toilet. Or try to make it to the next stop when you really have to go, just ask a guide for a pit stop. Enjoy the view. When will you ever again have such an awesome view from a bathroom? Avoid the rush hour, if possible, by using the restroom any time other than right after breakfast and before jumping on the rafts for the day. Don’t be shy! Everybody poops. Ask questions if you have them. Your guides are used to getting these types of questions.